When I started blogging I never would have thought that one day I would get an award for my blog. Here is my story. I started this blog in 2009 when I got Kyra, my feral 11 month old filly. Fresh out of the wild- well a nature reserve to be precise- and grown up without human interference. When my friend gave her to me (that is a story for another time) I had no idea if I could tame a wild horse or, if I could, how long it would take me. I was willing to give it a year and see what would happen. It was the perfect opportunity to start documenting this adventure for maybe a future book or something. So I started this blog as an online training journal and it was called ‘From feral filly to Success Story’. I wrote in Dutch and only a handful of my horse loving friends read it. I made a summary every month of our achievements. Read the summary of our first month of our training diary that I left on my blog. After a few months my interest in blogging about taming and training a wild horse faded because there was no reinforcement. In other words: I had no readers. I kept using my training journal (that was very reinforcing). I kept track of our progress and made a list of our achievements every month. After a year of blogging I stopped and almost entirely forgot I had a blog. A few years later I emigrated to Canada. I became a stay-at-home mom. I felt often very lonely without my social network, so I became very active on the Internet answering questions about positive reinforcement (clicker) horse training. After a while I noticed I was repeating myself all the time. Everyone seemed to ask how they could use clicker training more effectively and everyone seems to have the same basic problems. I wondered how could I help horse lovers more efficiently? I could use my blog! Then I could refer to a certain blog post that contained an extended answer to their problem! I wouldn’t have to write the same answers over and over. That’s how I started blogging about clicker training horses in December 2014. When I picked up on blogging in 2014 I pushed myself to write in English. It’s not my first language and at first it was quite a struggle. In the beginning it felt that I had to use Google translate every other sentence to look up a word. When I saw the word I remembered it again. Writing was a very slow process. I learned a lot about writing, getting my blog out there and delivering content on a regular basis. That’s what I did: I blogged and blogged and kept blogging, even though in the beginning I only had a handful of readers. I felt writers block, uninspired and fearful at times, but I kept going. Even though it’s rare that someone gives my blog a ‘like’ (the little star at the bottom) or comments on it. Did you know it is very reinforcing for a blogger to get a comment? Maybe next time you read a wonderful blog, leave a comment or click the little star. Slowly my blog grew and I got my first subscriber, and another one. I blogged twice a week and that is a big commitment. Setting deadlines helped to keep me going. I also love the achievements WP gives: they let you know when your ‘stats are booming’, when you’ve published one hundreds blogs and so on. Last week WordPress gave me an achievement: I started this blog 8 years ago! Wow! I had no idea! Thanks WP, that is so nice of you to let me know. Happy Anniversary with WordPress.com! You registered on WordPress.com 8 years ago. Thanks for flying with us. Keep up the good blogging. Then I got another surprise! In January 2018 my HippoLogic Facebook business page was tagged in a Facebook post of Feedspot. 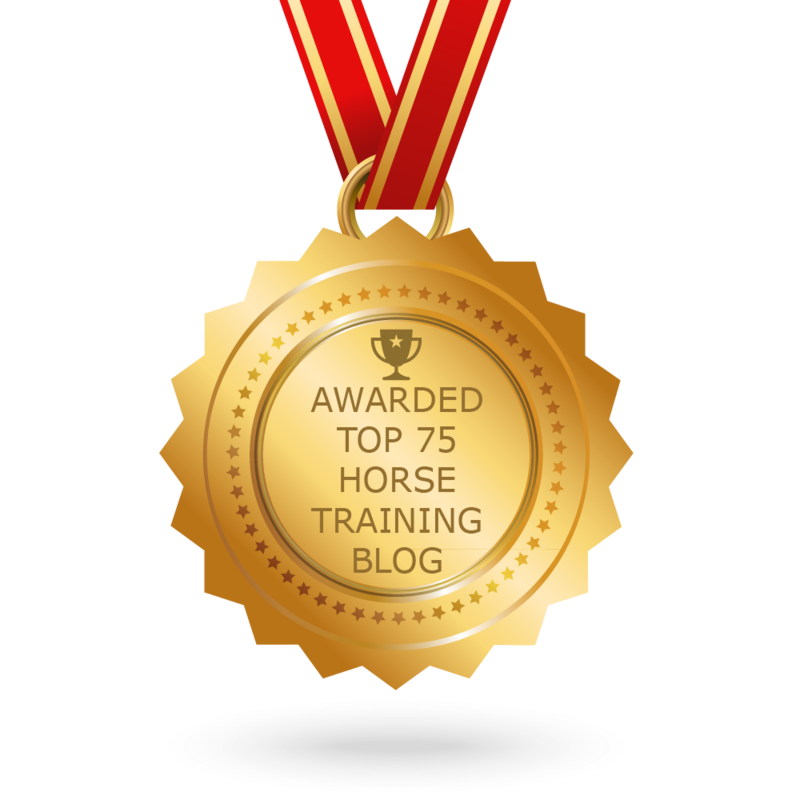 Curious what that was all about, I found out my blog had been awarded with a Top 75 Horse Training Blog. Wow! I didn’t know I was nominated, so this was a huge surprise! [Quote from Feedspot:] “CONGRATULATIONS to every blogger that has made this Top Horse Training Blogs list! This is the most comprehensive list of best Horse Training blogs on the internet and I’m honoured to have you as part of this! So this is how my blog became a Top 75 Horse Training Blog. Writing one blog at the time! And I kept going for 4 years, I will keep going to serve you. I am curious about the stories behind the other bloggers in this Top 75. Do you have an amazing story to tell about something you never dreamt of achieving? Please share your success story in the comments, I would love to read yours! If you don’t want to share and you like my story just click the little star so I know you’ve popped by and enjoyed my time with me. Sign up for HippoLogic’s newsletter (it’s free and you receive a gift) or visit HippoLogic’s website.